As 12 budding sports journalists embarked on the short seven-mile journey from the home of JMU Journalism to Marine AFC in Crosby, it was time to make sure everything was covered: facts, pens, laptops, nerves in place… check. 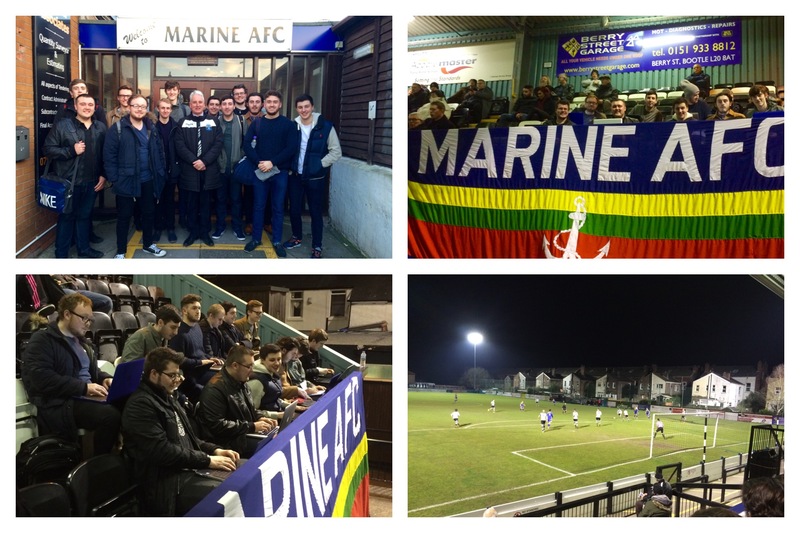 We’ve been practising match reporting in class all year, but could we do it on a cold Tuesday night under the floodlights at the Marine Travel Arena, or so the saying roughly goes? There’s always something special about coach trips and this one was no different. During a brisk 20-minute drive to the ground, the early evening setting sun was shining through the windows of the bus, as bright as the optimism of its journalistic passengers. As anticipation built and kick-off was approaching, only one thing could steady the nerves. Although not part of the recommended reporter’s routine these days, a couple of pre-match pints were in order and, before too long, the 7.45pm start had arrived. 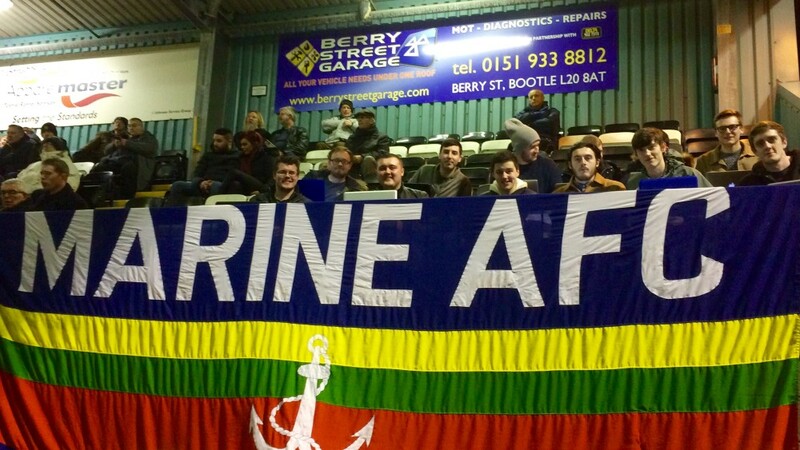 We took to our seats – a perfect front row view, albeit behind a goal – with the dedicated Marine supporters around us. 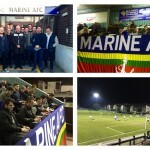 It was Marine v Buxton in the Evo-Stik League Northern Premier. 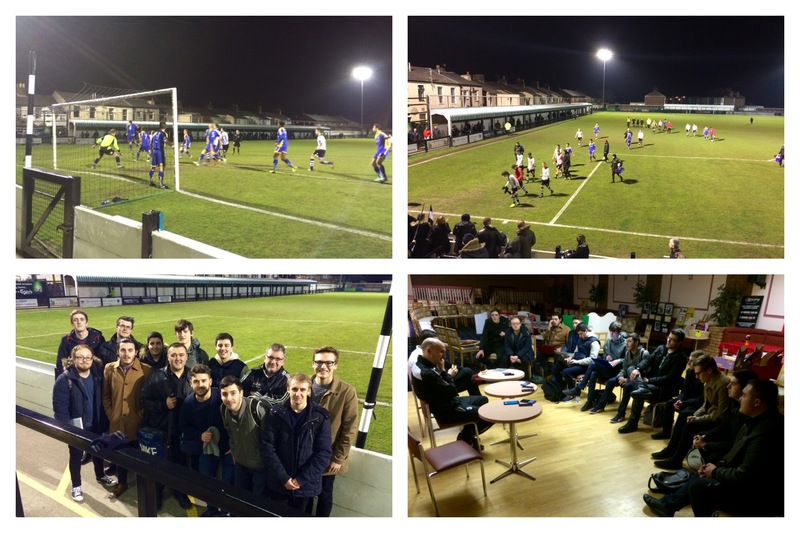 Although to some people non-league football is meaningless, for the 319 fans in attendance it meant absolutely everything. In what was a slow-starting affair, neither side looked like breaking the deadlock until a slice of luck for the visitors from Derbyshire changed that. In the 21st minute, a Buxton corner was cleared temporarily, but it landed perfectly at the feet of Niall Doran, whose deflected edge-of-the-area shot trickled into the bottom corner to open the scoring. This proved the first stumbling block for the reporters, as for some it was their first ever taste of live reporting outside of the newsroom and, with no commentary or replays to aid you, concentration really is key. Blink and you’ll miss it. Shortly after though, Marine got an equaliser in the 33rd minute, cue more frantic typing and fact-checking following Chris Sharp’s tidy finish as the forward let the ball run across his body before curling a shot inside the post. It stayed all square up to half-time, giving us a chance to adjust our reports and, more importantly, take a much-needed toilet break. 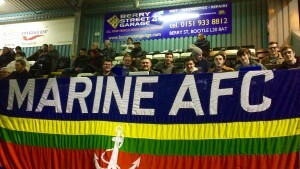 Within two minutes of the restart, Marine thought they had grabbed a second, only for top scorer Danny Mitchley to be adjudged offside, before his lob over the keeper. Following further key chances missed for the Mariners, they were made to pay when Buxton took a decisive lead. It was a strike worthy of winning any game, with Spencer Harris taking aim from 25 yards out and his perfectly-timed effort curling away from Matty Cooper and nestling into the top right corner, delighting the small section of travelling Buxton supporters. 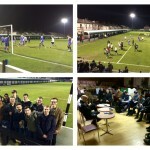 The Whites had further chances to rescue something from the game but their efforts were in vain. 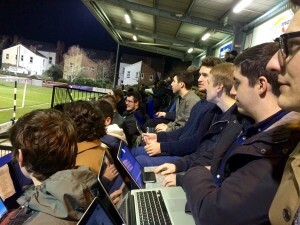 The final whistle brought disappointment to the home team as the Bucks triumphed 2-1, but relief to the journalists as near-frozen typing fingers were now just moments away from regaining feeling again once back in the warmth of the clubhouse ahead of press conference interviews with Marine players and coaching staff.